In the last year, I've agree to endorse a few books. The plus is I get free copies. The con side is that occasionally the book isn't my cup of tea. However, the problem I'm having with book reviews is that . . . well, you see, my heart's desire is to rave about a book without being obligated to rave. I LOVE LOVE LOVE sharing about books that literally (in a metaphorical manner) glued me to my seat. Actually in this case, the sofa. SHADOWED IN SILK is one of the best written novels I've ever read. Oh, let me tell you the basics about the book. Abby marries a swanky British soldier after a whirlwind romance. Only following their honeymoon, her husband leaves to serve in India. Fast forward a few years, and Abby and her son are traveling to India to put their family back together. What man wouldn't want his beloved wife with him? Problem for Abby is that her husband actually doesn't want her with him. He'd been happily content living apart. I blame the fact he has a . . . secret he doesn't want Abby to know about. Well on the journey to India, Abby meets a great guy on the boat. Geoff has a mission he can't tell Abby about because, well, he has a very good reason. Over the course of the novel, Abby and Geoff face all sorts of awful things about themselves and others. Before I go more into that, here's the official details about the novel. Now because Abby is married and because this book is targeted to the Christian market, both the author and the publisher ensured that the reader understood Abby's circumstances and empathized with her struggle to love the man she married and not love the man she loves. Now the romance storyline really isn't the prime focus. Both Abby and Geoff have their own journeys they have to travel apart from one another. Yet through it all, God kept drawing them together, which is a great reminder to the reader that He continually is working to take the unpleasantness of life and turn it into good. The lushness of Christine's world building made India come to life in my mind. I feel the need to watch the first three Indiana Jones movies even though they're set about 20 years after Christine's novel. 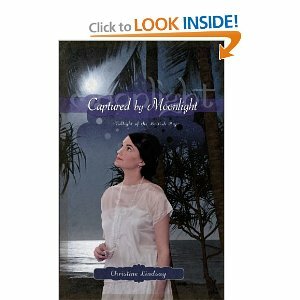 Christine's Book 2 in this series, CAPTURED BY MOONLIGHT, is available for pre-order by clicking HERE. This sounds like an interesting book with a great story line. Years ago I read a book in this time frame and setting. It was a fascinating glimpse into a part of history and a setting I wasn't really familiar with, but like you, Gina, it brought Indiana Jones to mind. I'm thinking I'll have to read this one. Well, I'm definitely going to have to read this book! Loved the review. Thank you, Gina. Thanks for the great review, Gina. I'm thrilled to see Christine's book released. She's taken a novel approach with the setting and circumstances and I wish her all the best success with it. You know, the problem with mystery writers reading romances is that I keep waiting for people to die. But with spies and political unrest and sinister secrets, this one might be a good one to try. I started it on my Kindle. Now if I just had time to sit and finish it! Can't believe I didn't comment on this. I blame crazy dance recital day. I've read this book twice. Once as a lowly word document, and even then I knew it was something very special. Hope Christine wins some awards with this one. I just feel like a total ditz for missing this FANTASTIC review by Gina. For missing this, I totally to not deserve her wonderful praise. Please everyone chalk this up to my working our my job situation. You know what it's like---having to work at a dratted day job in order to support your writing habit. Oy, and I'm bushed with having to change jobs and find a new one. So I hope I'm forgiven for not being around when this wonderful review was posted. Somehow I have to make it up to Gina. Whoops! I guess I could have done a different way of re-posting this. Technology...ugh. But with Christine's novel 2 coming out in this series, I felt like it was a fitting re-post because I'm sure an Inky will do a review of Captured by Moonlight. I loved the first book and have the second one on my Kindle. I know I'll love it too. Christine is an amazing writer!